The Last (Potluck) Supper. Church Basement Ladies. Now playing at Plymouth Playhouse, I-494 and State Hwy 55, Plymouth, Minnesota. For prices, call 763/553-1600. Group tickets: 763/383-1073. www.plymouthplayhouse.com. Change isn’t just for dollars anymore. Nope. Change comes to Lutheran congregations too, … even fictional ones. The inevitability of change is the theme of The Last (Potluck) Supper, the fifth installment of the Church Basement Ladies franchise. Following on the successful storytelling of A Second Helping, Away in the Basement, and A Mighty Fortress is the Basement, as well as the original, this show brings the story full circle. Set in 1979, The Last (Potluck) Supper recounts preparations for the celebration of East Cornucopia Lutheran Church’s 100th anniversary. Unfortunately, for the characters there are several twists to the plot. First, while congregants are celebrating the notable history of the church and what it has meant for its community, characters are simultaneously dealing with a major transition — the closing of the church, caused by dwindling attendance as young people (and the congregation’s pastor) are exported to the Twin Cities. Scandinavian Lutherans like to hold on to things the way they are. But the world is changing. Second, Mrs. Elroy Engleson, also known as Karin (Dorian Chalmers), who once doubted that women belonged in church leadership, is now the president of the congregation’s council. It is on her watch that the decision for the congregation to cease existence is made. Third, widow Vivian Snustad must come to deal with issues of closure — in her personal and spiritual lives. 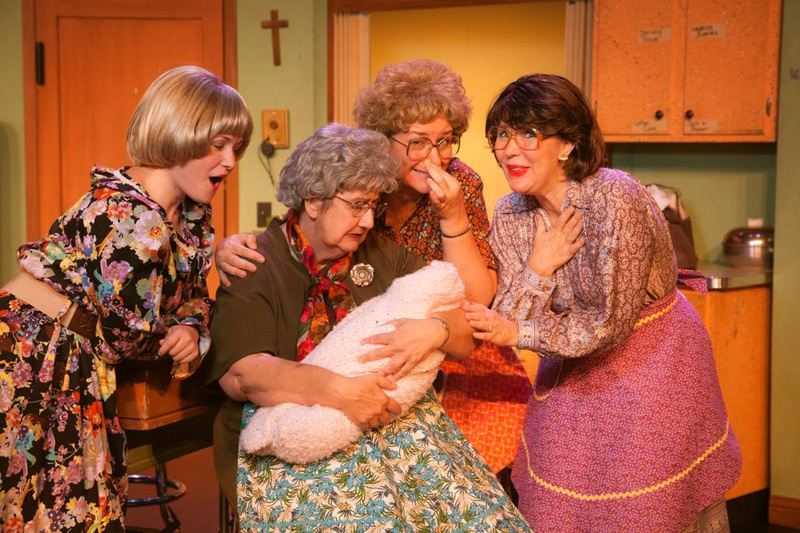 Whether audience members are seeing the Church Basement Ladies for the first time or have been regular attendees over the years, they will be changed themselves, watching with some degree of melancholy what is planned to be the final play of the series. An ending or a fresh start? Grosch was a bit circumspect about the conclusion of the popular franchise. “When I first started writing the screenplays [with the second iteration of the show], I envisioned that there would be five shows. A series of flashbacks provide that fresh look in The Last (Potluck) Supper. The entire history of the East Cornucopia congregation (from the perspective of the basement) is told in the family stories of the main characters. Some remind viewers of earlier shows; others dig back beyond the setting of the first offering. The Last (Potluck) Supper is playing at Plymouth Playhouse through February. It was workshopped at The Reis Center in Grand Rapids, Minnesota, where this reviewer saw the show. While the physical humor will keep viewers laughing, there is no getting around that it might be time for everyone now to move on.